There is a live goose in 'The Ferryman'. And a live rabbit. And a live baby. None of these things are particularly important in and of themselves, but I guess I have to start somewhere in describing this enormous, shattering eruption of a play from 'Jerusalem' playwright Jez Butterworth. 'The Ferryman' is vast, a play that's formally conventional but has an ambition that's out of this world, a sense that it wants to be about EVERYTHING. And insofar as is realistically possible, it succeeds. But despite the teeming cast and interwoven plot lines it remains intimate, set in the kitchen of a single Armagh farmhouse in 1981. 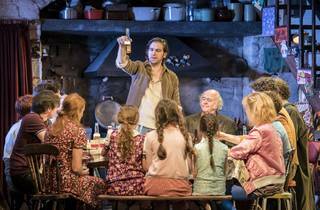 Bond director Sam Mendes's recent theatrical record has largely involved bombastic West End fodder, but here he controls everything with a powerful restraint that keeps 'The Ferryman' in sharp focus through every shift of shape. 'The Ferryman' is a play about Ireland and about Northern Ireland (Butterworth's family is of Irish descent). It is a play set at the height of Bobby Sands's hunger strike. It is a play about an era modern enough to feel recognisable, but far enough away that its older generation experienced the Easter Rising firsthand. It is a play about a mystical idea of Ireland in which fairies and banshees and magic all exist, somewhere. It is a play about youthful idealism and brutal adult pragmatism. Like most of Butterworth's work, it is funny, with much of the humour here coming from its child cast swearing like troopers. It is, in a more prosaic sense, about Quinn Carney (Paddy Considine), a loving father whose life has been haunted by the unexplained disappearance of his brother Seamus, leaving him and his distant wife Mary (Genevieve O'Reilly) to take in his brother's vivacious wife Caitlin (Laura Donnelly) who always clung to the possibility Seamus would return. But a body has been found preserved in a bog, and a watchful peace made possible by uncertainly is about to end. This is not a rehash of 'Jerusalem' - spoiler alert, but you might want to look to David Cronenberg's 'A History of Violence' for closer inspiration. And while Considine's performance - full of tenderness, authority, and suppressed violence - is remarkable, he is not a 'Rooster' Byron but a little part of a big, scary, beautiful world. He feels scarcely more important a character than his seer aunt Maggie Far Away (Brid Brennan), or his strange, shamanic English neighbour Tom Kettle (John Hodgkinson) or young Shake (Tom Glynn-Carney) seduced by thoughts of IRA glory. The play is vast - three-and-a-half-hours - but even though lengthy stretches are nothing more than generations bickering at the breakfast table, nothing feels wasted, every strand is respected, Mendes choreographs everything to perfection. And when the climax you half suspect is coming, comes, it is like a final, epoch ending volcanic eruption, the play's carefully constructed emotional checks and balances detonating in a maelstrom of violence and feeling that left me genuinely stunned. How to get cheap tickets: 20 front row stalls day seats for that night’s performance will go on sale at the box office every morning from 10.30am, priced £20 each. In person only. The cast as of Jan 6 is Owen McDonnell and Rosalie Craig as Quinn and Caitlin Carney, with Justin Edwards, Dean Ashton, Declan Conlon, Kevin Creedon, Sean Delaney, Saoirse-Monica Jackson, Terence Keeley, Laurie Kynaston, Stella McCusker, Francis Mezza, Siân Thomas, Catherine McCormack, Charles Dale, Mark Lambert and Glenn Speers. 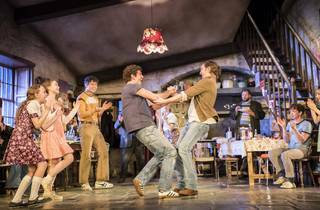 I'm a big fan of Jezz Butterworth - he is able to create a magic on stage that is reminiscent of Tennessee Williams. There were some flaws perhaps - a few characters too many, I wasn't sure about the Tom Kettle character (it felt more like a plot device than a real character), and the ending drifted towards an almost Tarantino-esque melodrama. But you are guaranteed a great night at the theatre with this one. Catch it while you can. 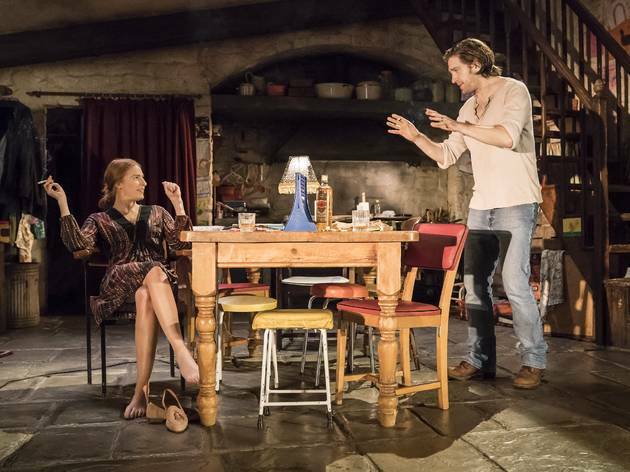 I have heard so much about The Ferryman since it first premiered at The Royal Court Theatre goodness knows how long ago, that I am probably the last person in London to actually see it! However, see it I did, and what a fantastic production it is. Set in early 1980’s Northern Ireland at the height of the troubles, the story revolves around the Carney family, particularly Caitlin Carney played by Rosalie Craig, whose husband is missing and she is helping out Quinn and his wife Mary, and their abundance of children. The theme of loss runs throughout the entire show from the relationship brake down of Quinn and Mary to the tension between him and Caitlin who is doggedly waiting for her husband to return. The audience are cleverly made aware from the start that her husband, Seamus is dead and found in a bog. I think this gives the opportunity to really watch and understand all that Caitlin and her son are going through. It is interesting to see how individuals behave when they are in a limbo position between remaining faithful to the person they are waiting for, whilst reacting to the thoughts and feelings they are having in the present, the push/pull of heartstrings between her and Quinn makes interesting and thought provoking viewing. It is a long play and at points, slow, but this never detracts from the action taking play and I never felt distracted from the story. Other interesting characters, mainly from the older cast include Aunt Maggie Faraway who fades out of life, before coming back and regaling the children with stories of where she has been, and Aunt Pat who’s hatred for Margaret Thatcher is understandably intense, and is constantly reminding them of the loss Ireland has suffered under Thatcher’s rule. It’s only on for a few more weeks, so be like me and catch it whilst you can. The traditional art of Irish story telling at it's best, totally griping, catch it while you can as this marvellous production is off to Broadway ! This was my view from my 90 pound seat - and, I was sitting on two coats when taking the photo, which put me at the same level as my husband who is 6ft tall and, was having the same difficulty seeing the stage as I was. And, I hasten to add, this photo was taken during the interval, so when those gentlemen in front of me turned their attention back to the stage, I could see even less. It was the worst seating in any theatre I've ever been in, anywhere in the world. I booked around 9 months in advance - phoned from Australia to talk to the booking office about the seating and was told these were the best seats in the house - they were certainly the most expensive; which I was happy to pay, thinking I'd have a prime view. There is barely any seating rake (2" at most) Now I can appreciate that this is an old theatre with a history and one wouldn't want to mess with that but, surely a raised floor could be put in without too much difficulty or expense and they keep the original seats if they must - though they were probably the most uncomfortable I've ever sat in - and would test the muscles in anyone's bottom, especially in a show that goes 3.5 hours. This was supposed to be our big treat during our visit to London and a month later I am still feeling disappointed and ripped off. Totally unacceptable. Being an Irish girl in London I was over the moon to get tickets to see this with a massive bonus that a friend of mine was in the cast playing Oisin so a very proud night overall. 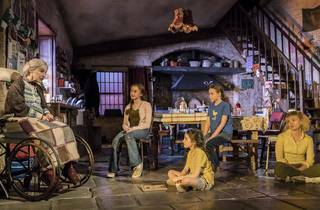 The Ferryman is an incredibly written play, each character crafted perfectly, letting the audience know exactly who they are and what they're about. Will Houston playing Quinn was actually the weakest for me but this was quickly forgotten about due to all of the strong female performances that surrounded him. Sarah Greene as Caitlin Carney was particularly impressive, playing a single mother who isn't sure if she's a widow or not, living in a house that's not her own, essential raising another woman's children and growing a natural and loving relationship with the man of the house (Quinn) her heartbreaking role grows more tragic as the play unfolds. One thing that really impressed me was how a whole play could take place in one room and not once did my mind wander or get bored of the detailed and intelligent set design during the 3 and a half hours, it was traditional in the sense that you felt like you were in a real Irish home. The scene after dinner where everyone gets up and starts singing and Irish dancing particularly tugged on my heart strings making me feel homesick and proud of the culture that I come from. Tones of humour and tragedy are balanced with great care, although some Irish accents were a bit off at times but I also reminded myself that they're are children and still doing a fantastic job! I don't want to say too much as the play as plenty of twists and turns. The acting is all-magical. You may go to see Paddy Considine, but you’ll be happy the focus of the play is not only at him (I mean, he’s really great, and could carry the play on his own; but everyone wins with such assemble!). I thought this didn't really live up to the hype, but was good nonetheless. It's a bit of an epic play at well over 3 hours, with only one proper interval (plus a 2 minute break where you're not allowed to go pee!). The story was multilayered, with so many characters it was nice for all of them to have their time in the spotlight. The ending was the only really dramatic bit. Some serious Irish accents, so watch out if you struggle with those, particularity if you've got a cheap seat at the back! Worth seeing if you can get a bargain ticket! Wow...Bravo, just bravo. Not knowing anything about the show going into it and being American, I was a little weary that I could lose some of the context of the story, just not knowing about the times and the historical background. However, the play was easy to follow from the opening and hooked me like a serial page turner. At 3 and 1/2 hours long, it didn't feel like it and keep me yearning for more. The cast was superb and the acting was on point. Definitely a must see! 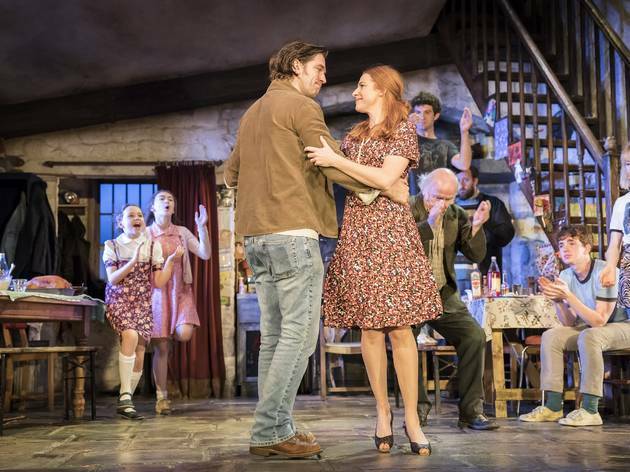 Despite an actor falling ill in the third act, only to be promptly replaced by an understudy, The Ferryman was still an overwhelming and remarkable experience. 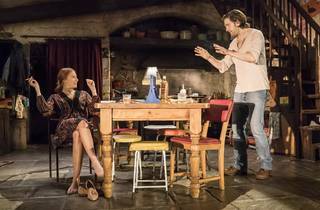 Jez Butterworth has created a wonder of play, full of humour and tension, with not a single word included flippantly. Paddy Considine embodies the role of Quinn Carney superbly and is brilliantly matched by Laura Donnelly's Caitlin. Surrounding this central pair is a wonderful ensemble cast, whose portrayal of chaotic family life is honest and often intensely charming. It's hilarious, it's gripping and at points, it made my jaw drop – don't miss what will be soon regarded as an iconic production. The expectations were high for this play as it's been touted as the play of the year and these expectations were mainly met. The cast are all brilliant and you really feel like you are watching an actual family deal with the events that transpire. For me, the ending wasn't quite as strong as I would have liked, but still a great play and a must-see! One of the most naturally acted pieces I've seen. It felt like I was literally sitting in a front room while my friend's huge family lived out their lives around me. The dialogue is just so good, so normal. Much of the play flowed along without me realising I was at the theatre. There are a few story telling scenes in particular that were wonderful. The characters are all fully recognisable and younger cast members often outshone the adults. I loved how all generations were represented on the stage. The play gives a human face to a period in recent history that many of us fail to understand or realise the legacy of. The ending sneaks up rather fast on you in the final act. I was sad it was over but also felt sense of relief from the release of the underlying tensions playing out on the stage. A powerful story about the Northern Irish history, where a family drama evolves around twisted relationship in a big Irish catholic family and their dealings with the IRA past and present. Very large and brilliant cast, including a group of children, a baby, a goose & rabbit. Set in a farmhouse in 1970/80s, where we are shown an attempt to confront political issues and also a romance story between in-laws. The play is terrific but way too long – 3 and half hours is a bit too much, it could have been a bit sharply. If you are unfamiliar with a Northern Ireland accent, you’ll struggle to make sense of some of the lengthy dialogues. Also, I think there are too many stereotypes, associated with the Irish culture, such as adults and children drink the whole day long, dancing Riverdance now and then, beating up each other. Why so many clichés? As a theatre play it's very powerful though with an outstanding cast and well-acted. Even though The Ferryman is an longer play than usual, with a running time of three and a quarter hours, I did not notice and I didn’t want it to end. The script flows so genuinely, it feels like you’re right there with the family in their kitchen. It also helps that the set is so detailed and cosy. The play is set in 1982 and tells the story of a family in Northern Ireland preparing for the harvest, while simultaneously hunger strikes are going on and some unexpected news is delivered regarding one family member who disappeared ten years prior. John Hodgkinson, who plays gentle giant and outsider Tom Kettle, provides some particularly heartwarming moments throughout the play, including a few where he impressively manages to control some farm animals on stage. I think this show is pretty much sold out, but if you can at all manage to get tickets - go! There’s definitely a reason Timeout are calling this the play of the year. All I can say is, this play is superb. Everything just brilliant. As plays go this one is long but I was so absorbed in the story I hardly felt the time pass. The story covers two days in a large Irish family who have suffered as part of the troubles in northern Ireland. The stage is filled with noise, laughter, emotion. The attention to detail is superb. The steller cast fight, play, dance and sing their way through the harvest and the unfolding drama. 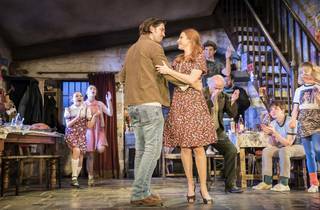 I highly recommend seeing the ferryman - if you can get a ticket! It's rare to find a play bringing me to my feet at the applause but I had no hesitation here. A devastating, powerful production that combines the mastery of Jez Butterworth's writing with Sam Mendes' direction. Hardyesque touches abound in the play's depiction of secret romantic yearning and the rhythms of pastoral rituals, and the ghosts of loyalty and duty loom over different generations and relationships as the actions and reactions of the past return to haunt each character. The play is full of masterful moments of theatricality (the catching fire of a table candle in the first five minutes; the unexpected appearance of real rabbits, a goose and a baby; the terrible eruptions of violence and bloodshed) and literary, cultural allusion (the halting yet painfully apt recitation of 'The Silent Lover'; the snatches of Yeats and folk-song from the addled mind of a Cassandra-like elderly aunt). 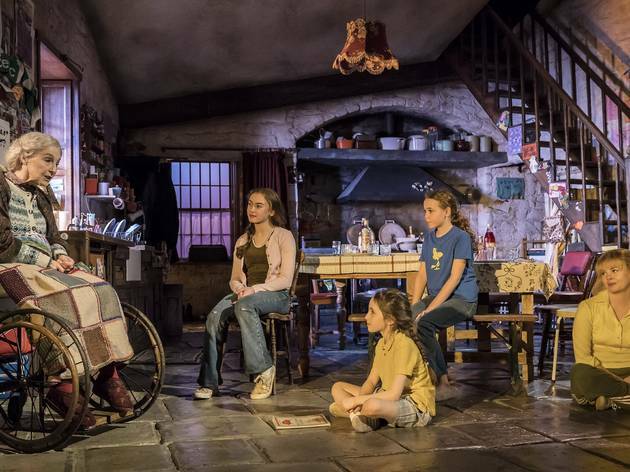 The set is beautifully rendered with the weathered beams and solid flagstones of a farmhouse rubbing shoulders with family photos, children's drawings, football scarves and magazine cuttings. Each character is depicted in no less detail, from the smallest of Quinn's lively brood to the disparate natures of the aptly named Aunt Maggie Faraway and the fiery Aunt Patricia. The past proves inescapable in devastating fashion in the closing moments of the play as Paddy Considine's beautifully controlled portrayal of the haunted Quinn Carney comes to a tragic climax. In his 'Seven Against Thebes', Aeschylus depicts the play's classical namesake as the lonely figure who ferries the dead to 'the sunless land that receives all men'. As the darkness of the auditorium encloses the stage following the shocking finale, those words take on a new terrifying significance. This play takes its time bringing you into the rhythms and tensions of a rural Irish family. The tension seeps in slowly, with revelations about certain people's associations with the IRA. But the play isn't so much political as deeply concerned with questions of loyalty and duty. It manages to pose these questions in an affecting, frequently humorous way over the course of 3+ hours, with impressive writing, acting, and set, light and sound design. 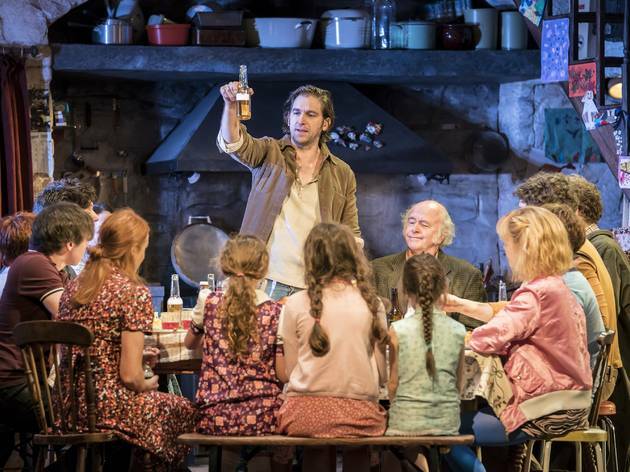 The Ferryman covers so much ground it's a miracle that it isn't a complete mess: instead, it's a stunning meeting of a stellar cast, a talented writer and a brilliant director, resulting in an incredible play. All of the big themes are dealt with: love, loss, family, conflict, but they are woven together in a way that doesn't make the show seem overcrowded. The naturalism of the Carney's kitchen at harvest offers insight into a world that is very similar to our own, but far enough away in time to seem dream-like. The brutal reality of the Troubles cuts through the rural idyll of the farm, and if you have any knowledge of the period, you know that the story could have no simple resolution. Others have pointed out how quickly the 3.5 hours flies by, and that is down to how compelling this story is, and how well it's performed. If you can get tickets for it, you really should. 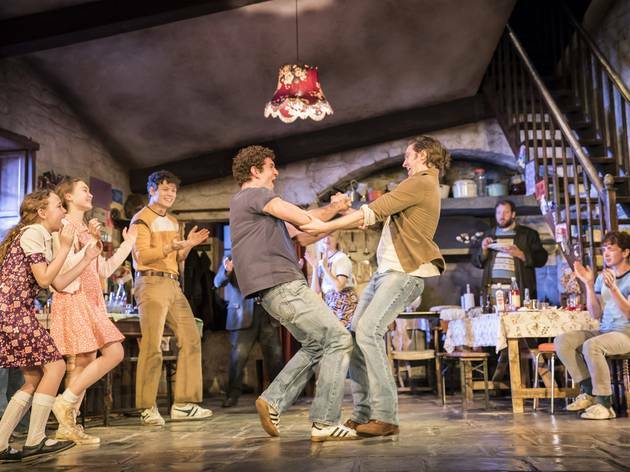 The Ferryman is unquestionably one of the best shows of the year. Fantastic acting and dialogue is the hallmark of this production. Although it was difficult to follow all the plot lines initially since the stage was inundated with the introductions of all the characters in the bustling family kitchen, the play quickly settled down. My favourite character was Tom Kettle, whose otherworldliness qualities often provided comic relief as well as haunting moments of beauty. Although very long, the play came to a fitting and very dramatic denouement. Although I had a very limited knowledge of Irish history, events mentioned during the play such as the Easter Uprising and Bobby Sands, made me determined to find out more. I can say that was the true legacy of this play. Superb, brilliant written and paced. Excellent acting from a perfectly cast play. A tad long to be honest but truly worth it. One Of the best plays I have seen this year, directed by Sam Mendes. It's long at 3.5 hours with only one interval, but three acts. The story is gripping and the acting by the cast is amazing, including the kids and the baby and the goose! First plan I have seen to have a real baby!! Not a fake one, a real one. The play has highs and lows and you go through a roller coaster of emotions, whilst watching it. Tickets sold Out for the Royal court run, it has now moved to the Gielgud theatre, so get your tickets before they sell out. Brilliant production. Enjoyed this as it captured so many emotions and being Irish some bits resonated with Irish families, the craic, singing. Fantastic acting and so many surprises. Absolutely loved this play - it's long but it flies by. Engrossing, funny, absorbing and an ending which will make you gasp. Must be one of the plays of the year! Get a ticket for the west end transfer while you still can. Every now & again the Royal Court hits the jackpot. This doesn't happen very often these days - so I'm more than delighted to welcome "The Ferryman". They were very much helped with a brilliant playwright Jez Butterworth, an outstanding director Sam Mendes & a perfect cast.This is the shortest 3 & a quarter hour play I've ever seen. It is totally engrossing, it's amusing, and its unforgettable. Get tickets for the West End run NOW ! As soon as word gets out, tickets will be imposdible. Play of the year so far for me. I'd say even edges out the Almeida Hamlet. (Not including the van Hove Roman plays as that was not in rep). Do anything you can to get tickets. Even for a first preview, this is a triumph.